Google Alphabet is bad at naming things. When YouTube Music Key launched November last year, I thought it was an unnecessarily long name compared to competitors like Spotify, Rdio or Apple Music. That could be changing soon. 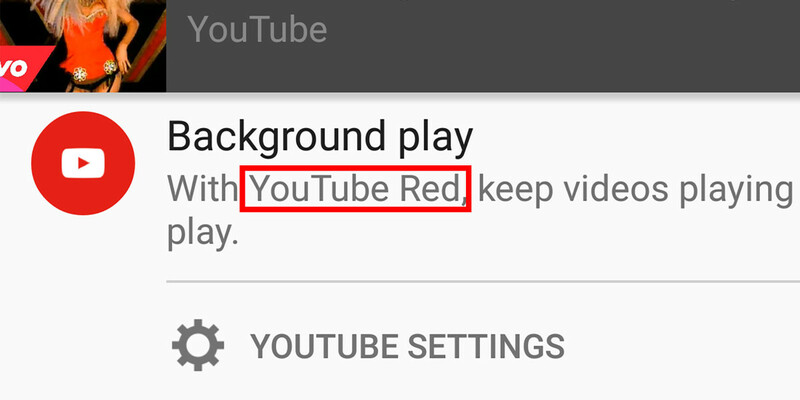 Android Police spotted the most recent update to the Android app uses a curious ‘YouTube Red’ name for the subscription service. The new branding only seems to show up as a notification blurb when you leave a video playing in the background as you switch to another app, or as a pop-up when you try to re-open YouTube later. You must have a fresh install of the Android app for it to work, and it still refers to the service as YouTube Music Key throughout other parts of the software and in documentation. I couldn’t find any relevant search results for “YouTube Red” either. Google is hosting a major event next week, and though new Nexus phones and an updated Chromecast will likely be stars of the show, we could be hearing more about YouTube Red. Music Key has been in ‘beta’ since its launch nearly a year ago after all, so it may be ripe for a new marketing push. A simpler name could go a long way towards easy publicity, especially in the wake of Apple Music and its heavy advertising campign. That said, it’s still possible YouTube Red will be more than a simple rebranding – the name change hints at a broader set of features for more than just music. That’s entirely speculative of course, but it’s not outlandish given years of rumors about premium YouTube content. Currently, Music Key allows you to save videos for offline playback and listen to them in the background on mobile devices, while also providing all the features unlimited Google Play Music subscription. We’ve contacted Google for comment and will update this post if we hear back.